Enjoy the lite version of the thrilling Jewellust-like puzzle game! Swap and burst evil spirits to clean the Kingdom from devilry. 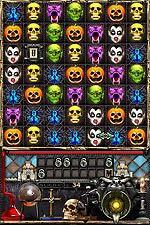 Full version has 40 levels, 2 game modes, 9 power-ups and comic Halloween theme make the game stylish and funny.